Pulley and belt systems are one of the easiest ways to change speed and torque in a system. If a small pulley is connected to a large pulley and the small pulley is the driver, the large pulley will turn more slowly but with increased torque or rotational force. If the large pulley had been the driver, then the small pulley would rotate faster than the driving pulley but with a lot less torque. These systems are used with air compressors, lawnmowers and automobiles. Locate the drive pulley. This pulley is usually attached to the driver, such as an electric motor or a gas engine. Measure the diameter of the drive pulley and write it down. Locate the load pulley. This is usually attached to a load, such as an air compressor, lawnmower blades or a transmission. Measure the diameter of the load pulley, and write it down. 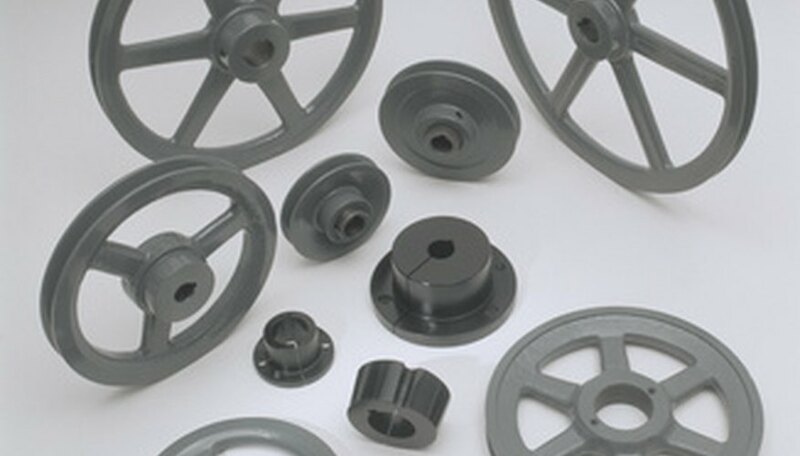 Divide the drive pulley diameter by the load pulley diameter. The result will be the pulley and belt ratio. For example: a 2-inch drive pulley and a 4-inch load pulley yields a pulley and belt ratio of 1/2. This means that for every 1 turn of the drive pulley, the load pulley will make 1/2 of a full turn. The speed of the pulley will also change in the same way. If the drive pulley in this example is rotating at a speed of 1000 revolutions per minute, then the speed of the load pulley will be the pulley and belt ratio times the speed of the drive pulley or 1000 rpm times 1/2 which equals 500 rpm. Torque has an inverse relationship to the pulley and belt ratio. If the drive pulley in this example has 10 pound feet of torque, then the load pulley will have 10 lb. ft. times 1/(1/2) which equals 20 lb. ft. of torque.